This week we're running a special #DIESELTRIBUTE takeover in celebration of Nicola Formichetti’s new role as artistic director and his newly launched Tribute collection. From exclusive mixtapes to behind the scenes footage from Nick Knight’s campaign shoot, we’re exploring all things Diesel, denim and DIY. Shot entirely on iPhone, the #DIESELTRIBUTE campaign brings together two of the frontrunners of fashion’s online revolution: Diesel’s artistic director Nicola Formichetti and visionary photographer Nick Knight. 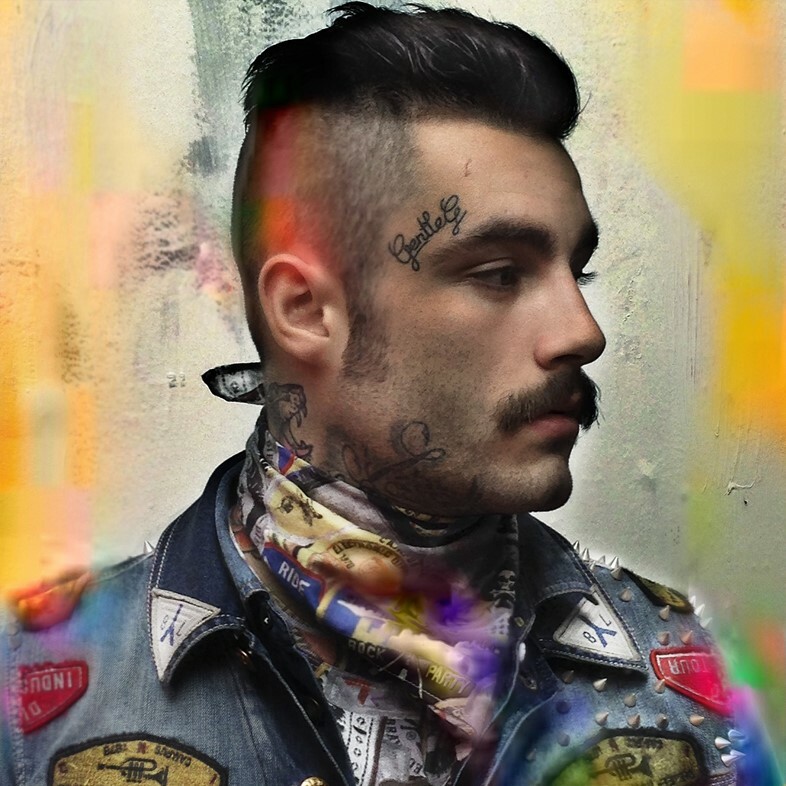 While the collection itself is decidedly low-tech – handcrafted patch-covered artisanal denim riffing on 35 years on Diesel history – the campaign goes guns blazing into new hi-tech territory, exploring Knight and Formichetti’s unbridled love of all things digital. Apps like Mega Photo and Glitché have been used to alter and distort each frame into almost painterly interpretations of screen errors and neon colour bleeds, adding another layer to the DIY ethos of the Formichetti’s collection. The behind the scenes video – set to Angggry Byrdz by rapper and performance artist Mykki Blanco, who also graces the campaign – is as artful as the finished thing. The beauty of the making-of has long been a major part of Knight’s oeuvre: through SHOWstudio, his groundbreaking online platform and laboratory, Knight has steadily focused on the beauty of the knots and bolts turning behind the calm exterior of the completed image. And following on from Formichetti’s call to creative arms on Diesel’s Tumblr, the campaign forgoes the classic fashion system by skipping print altogether, implicitly encouraging people to get creative and shoot stuff on their phones. Starring a cast made up of models, performers and new faces discovered by Nicola Formichetti, the campaign is infused with a raw and sexual energy and sets the tone for Formichetti’s new Diesel tribe. The clothes are brought to life through Instavids and GIFs, which can be viewed exclusively on social media and in digital installations in select Diesel stores. Here, Laura Bradley speaks to Nicola Formichetti about his casting philosophy, working with Nick Knight and pulling open the curtains on the fashion system. Dazed Digital: How did you feel when the suggestion to shoot on iPhone came up? Nicola Formichetti: I didn’t even think, I was just like, that’s it. For me this campaign was all about speaking the language of the young generation. I do want to do a campaign to advertise but sorry magazines, I don’t want to do anything on print. I just want to go straight to into digital. This was the first capsule I did for Diesel, something very instant. We made it, then put it out there straight away. When Nick suggested that [we shoot on iPhone] I was like, genius! The meaning behind it is so incredible – to see the master using the same tool as you or the same app that you can download and you can copy the way we do it. Maybe you can do something better or worse. You challenge people to open up and it’s genius I think. DD: It’s quite funny because I’m used to seeing Nick with a big camera and now he’s on his iPhone using apps I’ve never even heard of! Nicola Formichetti: Mega Photo was the one that I use all the time. Glitché was the one that he uses and it’s incredible. It’s so special, it’s so now. We’re speaking the same language as the people that use Tumblr and Instagram and it’s just the world that we live in now. The fashion system is still behind closed curtains. Nick was the first to use backstage live streaming. I remember when I was shooting with him before I was like ‘Why do we have cameras backstage, it’s so scary’. We were like ‘Oh, we have to say something nice now’. Ten years ago he did that and now the process is slowly, slowly opening up because that’s as interesting as the final product. In a way, this is a continuation of that. He’s showing that at the end of the day, you just have to have great ideas and passion and if you believe in something it doesn’t really matter if you use an iPhone or camera. It’s just about ideas and creativity. I think that’s such a beautiful message. DD: Nick was saying how inspired he was by the characters that you used in the performances. How did they all come to be involved? Nicola Formichetti: For me, the casting is always very important and I work very organically. I always have people in mind that I love – people I’ve found from different sources, from the Internet, Tumblr. I work with a casting agency, mostly AM Casting. I like working with a bunch of people that I am inspired by so it’s always works best for me when you find someone today, you shoot them today and you show it today. I’m interested in different kinds of characters, creative people. It’s not really the way they look. I’m interested in what’s on the inside and whether they have this attitude. So I just chose people that fitted into that category. Mykki Blanco was somebody that I really admired as a performer. He’s a rapper and a female and male character – beautiful, so beautiful – and then we had other non-models that had this great attitude. Josh from Birmingham, he was incredible, it was his first shoot. It really excites me to bring different people from all over the world into one place. Another girl Hirari from Japan whom I found in Tokyo, she doesn’t speak a word of English. She flew over from Tokyo and you see her trying to communicate with hands and stuff. I was the translator because I speak Japanese. It was very organic. I suggested some people and Nick suggested some people. With Nick it’s always progressive and always pushing forward and I learn so much when I work with him. DD: What do you enjoy most about working with Nick? What comes out when you two collaborate? Nicola Formichetti: We’re both very passionate and when we work together I forget time and we’re just really concentrating on creating and documenting beautiful moments. I did loads of stuff with him for Dazed and AnOther with Gaga with the album tour. It was insane. Of course sometimes it’s hard and stressful because you really want to get the amazing stuff but then everything is worth it because you feel like you’re doing something new. With Nick it’s always progressive and always pushing forward and I learn so much when I work with him. With Diesel, I feel like it’s such a big global brand that we had the task of making it even more global and relevant. Nicola Formichetti: We’re going to do so much amazing stuff from now on. We have a big Diesel show coming up in March that I want to make a game changer. I want to do something that’s just outside the box and try new things. It’s so boring out there you know? I feel like we should do great stuff and new stuff, always pushing because someone has to!